Giuliano Alesi is the winner of the GP3 Series race 2 at Hungaroring what is second win of the season for the young French driver. After a bit chaotic start, Giuliano Alesi built a small lead to his Trident teammate Ryan Tveter while Kevin Jorg and Alessio Lorandi were further behind. The Italian then retired on lap 4, allowing the Saturday’s race winner Jack Aitken, Dorian Boccolacci, Anthoine Hubert, and Niko Kari to start chasing Jorg for P3. Even after several VSC periods, Alesi comfortably won the race while his teammates Tveter and Jorg earned the podium finish for the first time this season. The supremacy of Trident was confirmed by Boccolacci’s 4th place. 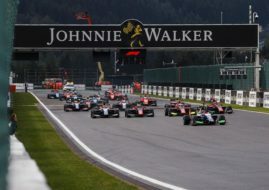 The next round of the GP3 Series will go on August 26-27 at Circuit de Spa-Francorchamps.